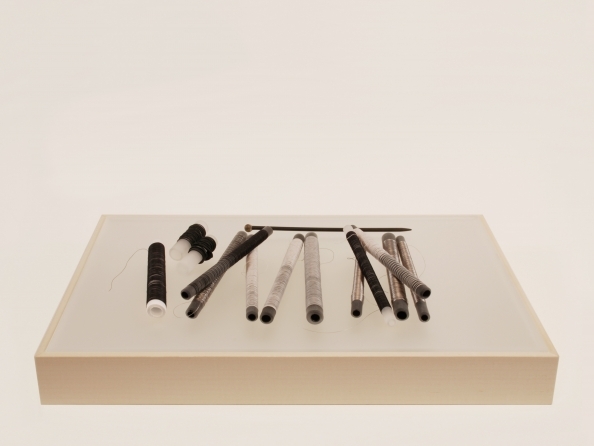 Alfredo Jaar, Teach us to Outgrow Our Madness, 1995, Neon, 46 x 108.5 inches. For over forty years Rhona Hoffman Gallery has been driven by art’s transformative power to bring about awareness and inspire political change. The gallery’s final 40th anniversary exhibition, Part 3: Political features artists from the gallery’s history who daringly expose political and social injustices; address artificial ethnic and racial borders; use language to uncover the tools of political power; and bring awareness to education and environmental politics. Leon Golub and Nancy Spero painted with raw emotion a protest against warfare and political oppression. Golub’s monumental canvas Riot III elevates student protest, while his intimately scaled painting Mao Tse Tung (In Sarcophagus) shows the vulnerable humanity of the self-magnified Chinese dictator. Nancy Spero’s powerful feminist, anti-war works are exemplified by her 1966 Bomb collage, in which the shape of a nuclear bomb morphs into human faces. In contrast to Golub and Spero’s visceral depictions of the body, Andy Warhol’s iconic screen-printed Electric Chair gives a more detached but just as powerful image of political execution. Memoirs of a Survivor by Annette Lemieux picture the collective trauma of the Holocaust and WWII, while Brian Maguire’s painterly, luminous canvas unveils a contemporary scene of anonymous immigrant bodies washed up on a shoreline. Emily Jacir, Michael Rakowitz, and Michal Rovner address political tension in the Middle-east, while Gordon Parks, Dawoud Bey, and Lyle Ashton Harris show racial injustice within our own borders. Palestinian artist Emily Jacir asked her exiled countrymen, ”If I could do anything for you, anywhere in Palestine, what would it be?,” then using the liberty of her American passport to cross borders and fulfill their wishes. 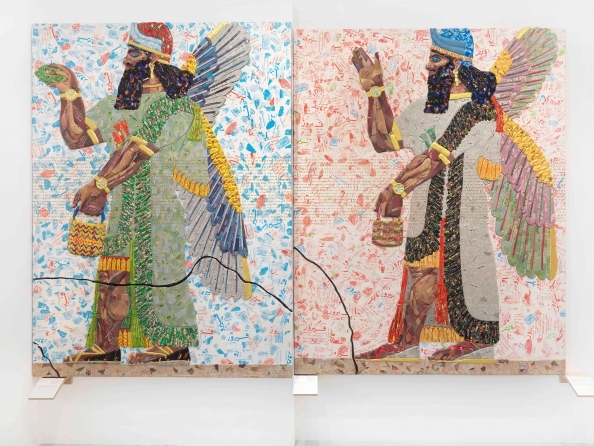 In a new iteration of his ongoing project, Michael Rakowitz’s May the Obdurate Foe Not Be In Good Health recreates ancient Syrian artifacts endangered or missing amid the country’s civil war. Michal Rovner’s poetic project Makom shows the slow construction of a large cubic monument, with careful selection of stones from Israeli and Palestinian houses, for the structure to only be taken apart after its completion. Closer to home, American photographers Gordon Parks’ and Dawoud Bey’s poignant pictures of children fenced out of an amusement park in the Jim Crow South (Parks) and imagined portraits of the young victims of Birmingham’s 1963 Sixteenth Street Baptist Church bombing (Bey) inspire hope for a future generation to eliminate senseless racism and segregation. Conceptual artists Tania Bruguera, Jenny Holzer, and Alfredo Jaar have employed and inverted language to expose its political power to motivate, deceive, or placate the public. 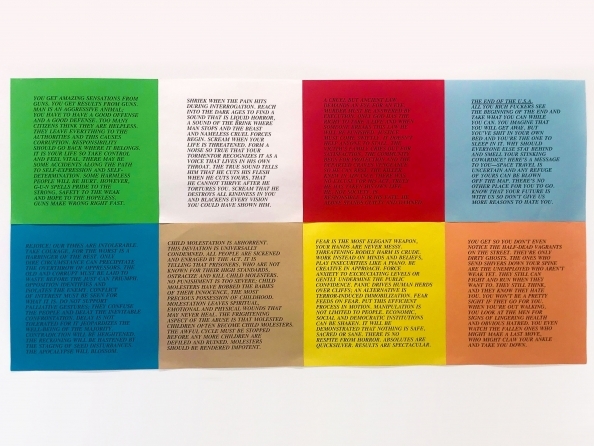 Jenny Holzer, who has exhibited with Rhona Hoffman since the 1970s, is represented in 40 Years: Part 3 with her Redaction painting. Holzer uses de-classified government documents and obscures redacted text as Minimal or Modernist areas of paint, echoing Agnes Martin or Kazimir Malevich. John Preus and Tim Rollins and K.O.S. (Kids of Survival) work within the education system and place hope in future generations. 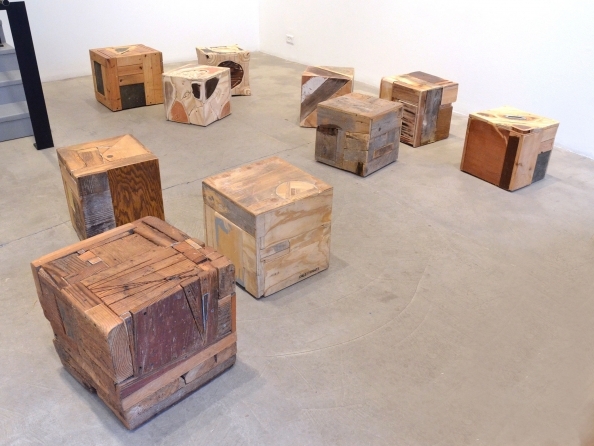 Preus uses materials salvaged from recently-closed Chicago Public Schools to create sculptures and installations that reinvigorate the materials with new meaning, while Tim Rollins’ long-time collaboration with disadvantaged kids from the South Bronx (K.O.S. or Kids of Survival) challenges traditional power dynamics through education, service, and collective art-making. Hamish Fulton and James Wines address environmental politics and resource preservation, as does Chicago-based artist Dan Peterman, whose signature material is post-consumer reprocessed plastics. In 40 Years: Part 3, Peterman’s public sculpture Love Podium figures prominently and functions as a platform for two speakers to read oppositional texts. The readers stand behind podiums facing opposite directions, yet find themselves inevitably side by side. 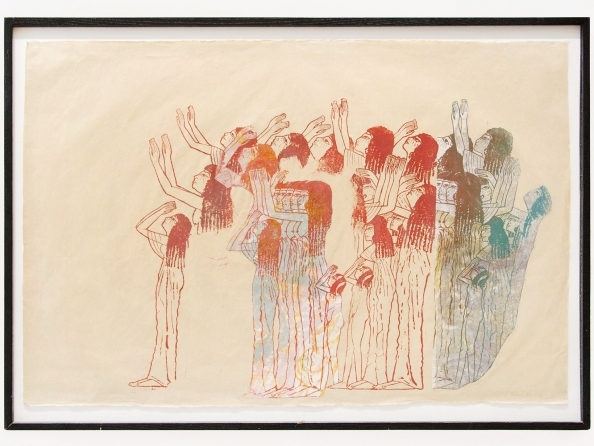 Likewise Rhona Hoffman Gallery has remained fiercely committed to serving as a platform for an internationally diverse array of artists to share powerful work with the public to inspire social and political justice.